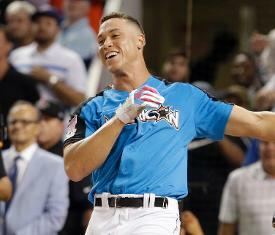 Aaron Judge won the Home Run Derby as a rookie, but he's said all season he won't defend his title. Selected as an All-Star starter on Sunday, the New York Yankees left fielder confirmed his mind was made up. "The main reason why I did it (in 2017) was for the fans," Judge said on Sunday. "That's really the only reason why you do it ... for the fans. Put on a good show. Judge slumped after the All-Star break last season, putting a damper on an otherwise stellar rookie season. Judge hit 30 of his rookie record 52 home runs and was batting .329 before the break last season. He hit just .228 after the break although he ended the season on a tear with 15 home runs in the last 25 games. This season, Judge has 25 home runs through 85 games for the 58-29 Yankees. Giancarlo Stanton, who Judge beat for the title last year when Stanton was still with the Miami Marlins, also says he won't participate this year even if he wins the fan vote for the final All-Star spot. Stanton, the 2016 winner, led the Majors with 59 home runs last season and has 21 so far this season, his first with Yankees. "I don't want to," said Stanton. "I've done it plenty of times. I can take a year off. I can take two years off if I want."